Samsung’s ‘Bixby Assistant’ is actually a new ‘artificial intelligence’ that’s meant to be featured into the upcoming Galaxy S8 and S8 plus. We’ve already unraveled this ‘news’ on one of our previous posts, so it is one of the exclusive features that will be integrated on Samsung’s flagship device. Bixby, similar to Cortana, Google Assistant and Apple Siri, can make your phone helpful, the new AI can assist you in completing tasks, telling you what you are looking at, learning your routine and also remembering what you need to do. Bixby is definitely a new way to interact with your Samsung Galaxy device. To begin with, you will need to install the new Samsung Galaxy “S8 Launcher” on your device. This is required if you would want to adequately run Bixby on your old Samsung mobile. The launcher is totally Free, so you can install it from here. Next, switching to the new downloaded S8 Launcher will be necessary. So to get this one going, navigate to Settings and dive into Applications. From here, tap on the three dot menu and then click on the ‘Default Applications’ options. From the next window, tap on the “Home Screen” option and select TouchWiz Home from the list. Then tap the “Home button” to switch to the new S8 Launcher. Install ‘Bixby assistant’ on any Samsung Galaxy device is perhaps too simple. The procedure will require you to ready your brain and mobile. Also make sure you’ve enabled Unknown Source via your device Settings. Next, download Bixby.apk and install it on your Samsung device. Once you’ve installed Bixby, navigate to your device ‘Home Screen’, then tap and hold the Home Button. From here, select “Home Screen Settings”. This’ll take you to the S8 Launcher Settings. Now tap on “Hello Bixby Settings”, Followed by the “Hello Bixby Cards” and enable the apps inside. Reboot your phone afterwards. When your device reboots, tap and hold (long press) on the Home Button, you’ll see a toggle icon on the top right of Hello Bixby. Simply enable or turn it ON. Then swipe left to get Bixby cards. Once you’re through, Bixby Assistant will be running on your Samsung device. Getting started with Bixby is quite simple, just push the Bixby button and start asking questions. Bixby knows your phone’s apps and how to use them. You can talk or type, because Bixby understands it all. Bixby also brings an intuitive UI, it lives inside your phone’s Camera, Gallery and Internet to give you a deeper understanding of what you are looking at. Bixby can learn your routines, so you’ll always have the right content ready. 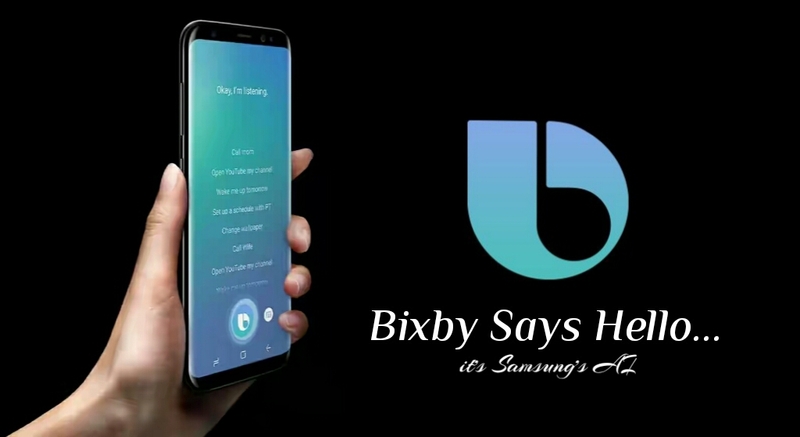 You can now say Hello to Bixby, it is the new AI from Samsung designed to make your phone easy. Note: only the “Bixby Cards” are available in this version, thus you won’t get the exclusive features that Samsung “showed off” during the Bixby introduction. Features such as screen context based results, image based search and voice features aren’t available for now, however we’re anticipating this on the app’s new update. Till then enjoy Bixby on your Samsung device running on Nougat. Endeavor to tell us your experience with Bixby.